The Hydroptere becomes the first flying hydrofoil to cross an ocean. The Hydroptere left Los Angeles on Monday 2 June 2015 and has just arrived in Honolulu after a crossing of more than 2215 nautical miles (4102 km). The Transpacific record was not beaten as the weak wind conditions along the route did not allow the trimaran to achieve high cruising speeds. The challenge of this first crossing was of a different nature. 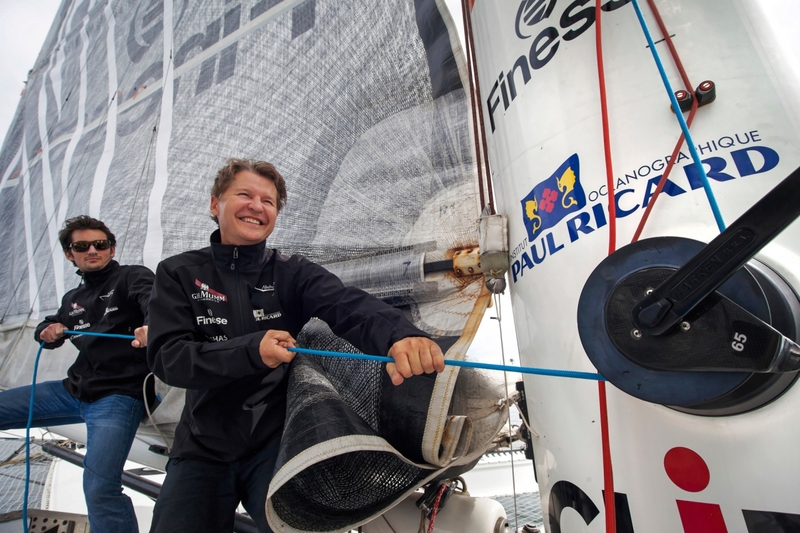 Despite clearly unfavourable conditions, Alain Thébault and his crew took the decision to go, not to miss a historic encounter. Within a few hours, André Borschberg aboard Solar Impulse, the first 100% solar energy powered aircraft, in turn, will land in Hawaii. An exceptional encounter will take place between two legendary vessels, one powered by the energy from the sun and the other one by that of the wind. Two high-tech giants, two pioneers in their field and a single message: "use clean energy". 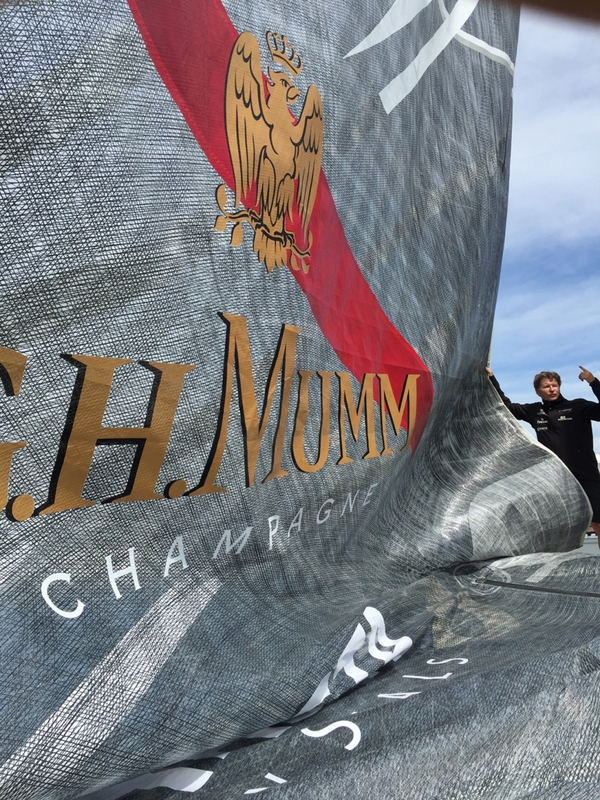 Mumm House of Champagne is proud to celebrate long-standing friend of the House and record-breaking sailor Alain Thébault, as he prepares to embark on his next daring challenge: to break a new world record speed with the famous Hydroptere boat this spring. Throughout its history Mumm has been dedicated to pushing limits in the pursuit of victory, and seeking international partners who are breaking boundaries to shape our future. These are the same core values that lie at the heart of Thébault’s endeavours, making this a natural partnership for the House. Alain Thébault first became introduced to the House through Paul Ricard, founder of Ricard and the Pernod Ricard Group. The pair instantly bonded over a shared vision and common values and Thébault has remained in close contact with the Ricard family throughout the years. Today, Paul-Charles Ricard – Paul Ricard’s grandson and the current International Marketing Manager for Mumm – has decided to celebrate this story with a partnership based on their shared pioneering spirit and ambitious quest for excellence. The innovative Hydroptere boat was introduced to the world by legendary captain Eric Tabarly in 1987, with the goal of pushing the boundaries of sailing technology and creating the world’s first ever ‘flying’ boat. This extraordinary sailing boat has since exceeded expectations following extensive innovation from aeronautical and marine industry experts, earning its title as one of the fastest sail boats in the world. Thébault has worked relentlessly with the Hydroptere project alongside Tabarly and became the first sailor in the world to cross the wind barrier with this groundbreaking sail boat, earning him the title of the fastest sailor in the world in 2009. Thébault’s dedicated quest for excellence has propelled the technology for this exceptional boat forward and with Mumm’s support he will now prepare to break yet another world record, striving to keep his title of fastest sailor in the world, and continue to shape the future of sailing. The journey will begin in California where Thébault will navigate between Los Angeles and Honolulu on-board the Hydroptere. Working with relentless perseverance and commitment on this exceptionally fast sail boat, Thébault now takes a further risk endeavouring to break a world first, completing the record in just four days to beat the current South Pacific record of four and a half days. Joining him is an impressive team of co-skipper Jacques Vincent, engineer Jeff Mearing, and sailors Yves Parlier and Jean le Cam, who will be at the helm for this oceanic adventure. Philippe Guettat, Chairman and CEO for Mumm House of Champagne, commented: “The long-standing friendship between Alain and the House was founded on shared values of passion, commitment, a pioneering spirit and the pursuit of victory. This continues to be of utmost importance to us so it was natural for this relationship to extend into a partnership. We are proud to support Alain as he goes on this daring quest to break yet another impressive world record.” Mumm will support Thébault and the team in its ground-breaking quest for speed and precision throughout the journey. A jeroboam of Mumm champagne will be presented at the finish line to honour these true pioneers and to reward their pursuit of this inspired victory.